As manned aircraft missions become increasingly expensive and dangerous to human life, alternate approaches are critical to affected industries, such as military, agriculture, forestry and search and rescue. Kawak Aviation is dedicated to helping advance and supply the technologies for unmanned vehicles used by industries that require flexibility for long endurance missions, cost savings, high risk, and dangerous environmental exposure. The Blue Devil ll is a reconnaissance airship built for the United States Air Force that was to be used in the War in Afghanistan. It was designed to capture and process data using on-board sensors then deliver the information to bases of operation, ground troops, and support aircraft. 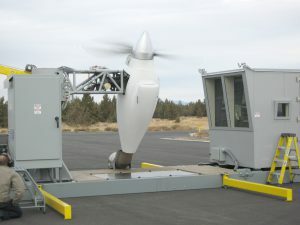 Kawak Aviation Technologies was hired by prime contractor, MAV6, to the Air Force, to supply the turbine propulsion systems required for the maneuvering of the Blue Devil Airship ll (M1400). Kawak Aviation took on the project and completed it within a record breaking 16 months. The initial contract to Kawak was for design and delivery of VTOL engine assemblies, VTOL fuel systems, and an engine test rig. As the project progressed Kawak was awarded the contracts for the, LTS, VGB, PSRU, and turbine pylon structures. The following are brief descriptions of the systems and equipment designed and manufactured by Kawak Aviation Technologies for the Blue Devil Airship ll. 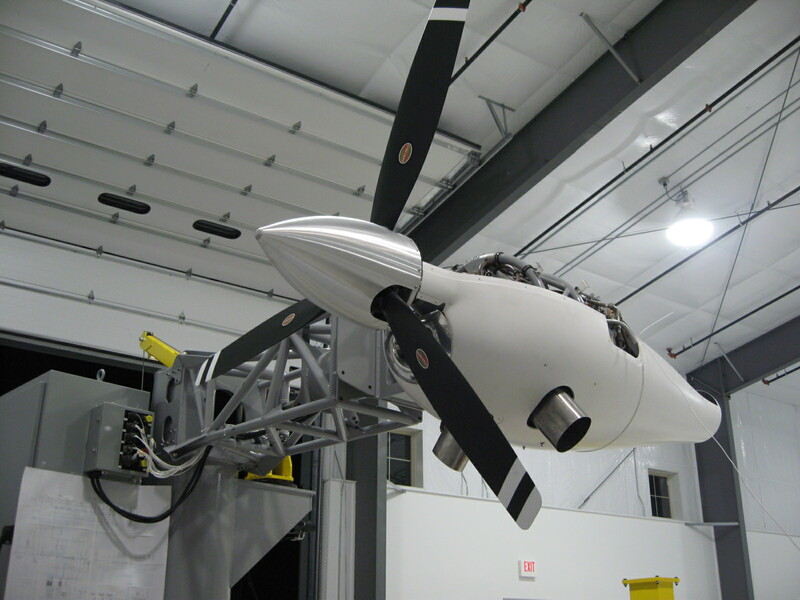 These are self-contained vertical takeoff and landing (VTOL) engine assemblies utilizing 1100 HP Garrett turbine engines and are capable of 5000lbs of thrust and continuous operation from 90 degrees nose down to 70 degrees nose up. The purpose of the VTOL assembly on the airship is to assist with short takeoffs, landings, and for high speed travel. Several unique features of the assembly are the engineered lubrication system components and their ability to support the engines lubrication needs while vectoring the engine outside of its specified operating limits. The engine controls are also unique in that they are operated via Kawak electric linear actuators that are linked to the airships RS422 communication network allowing for fly by wire operation. Installation and removal of the assemblies requires simply the connection of several electrical and fluid couplers while 4 bolts fasten the VTOL assembly to the vectoring mechanism. 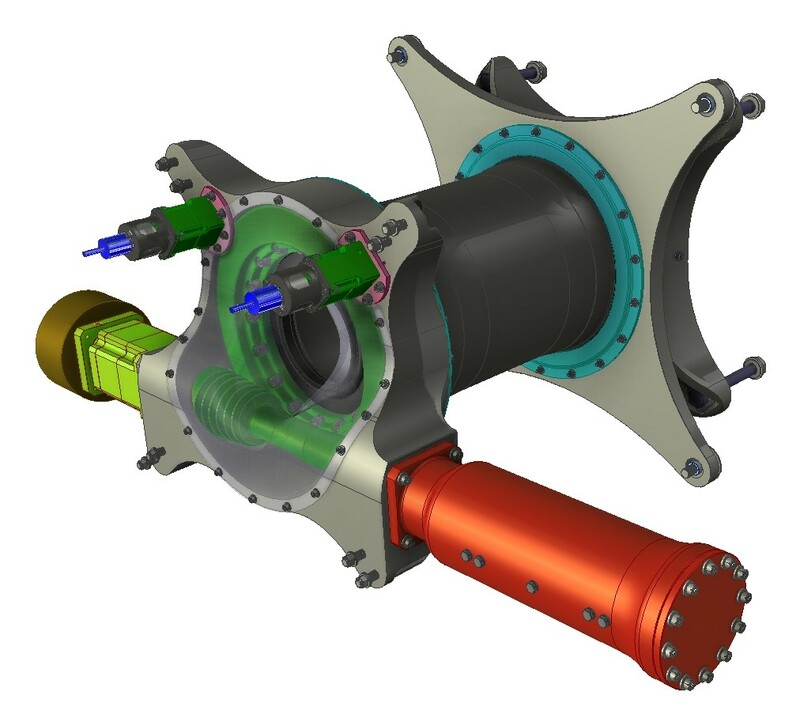 The vectoring gearbox (VGB) assemblies are used to vector the VTOL engine assemblies on the airship as required for vertical takeoff and landing operations. They incorporate a 400Hz AC drive motor and mechanical stop device to accurately control rotation of the ring and worm gear type drive mechanism. To precisely measure and position the rotation of the VGB there are redundant position feedback sensors that sense the rotation of the gearbox output shaft. This is a self-contained lateral thruster system (LTS) engine assembly utilizing a 450 HP Rolls Royce turbine engine and symmetrical propeller blade profile capable of 100% thrust in forward and reverse blade pitch. 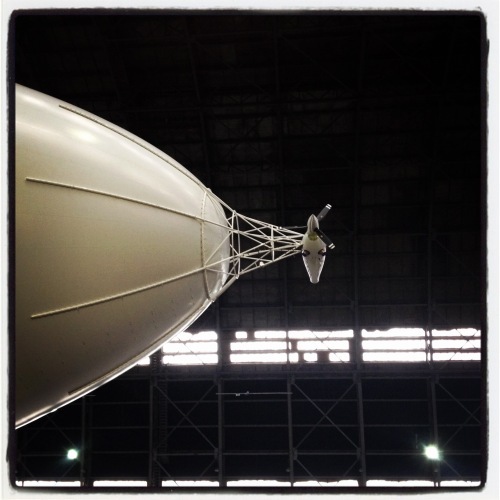 The purpose of the LTS assembly on the airship is to provide rudder control while performing takeoff and landing operations. One of the major challenges with this engine is that it was never designed with equal forward and reverse thrust in mind; so to accomplish the 100% thrust in each direction the engine fuel controls were modified and tuned to provide a new range of power and propeller pitch inputs to the engine. These fuel controls are then operated via Kawak electric linear actuators that are linked to the airships RS422 communication network allowing for fly by wire operation. Installation and removal of the assembly requires simply the connection of several electrical and fluid couplers while 4 bolts fasten the LTS assembly to the truss structure on the airship. 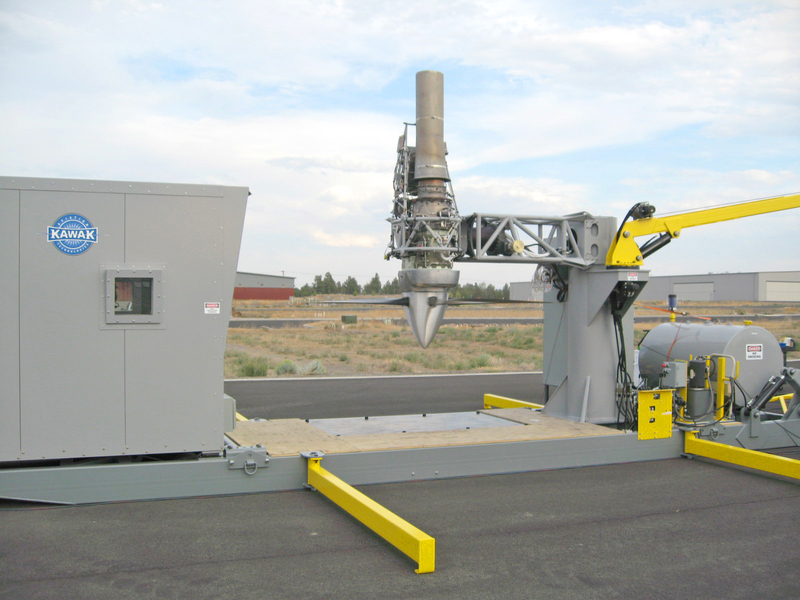 The Fuel systems are designed to supply the VTOL and LTS turbine engines with the engine manufacturer specified volumes and pressures at distances over 200 feet in line length and over 50 feet in head height. The biggest hurdles faced when designing the fuel systems were accommodating the large variances in fuel pressure requirements due to the airships maximum nose up and nose down operating angles of 30 degrees. Using COTS aerospace parts Kawak was able to overcome these hurdles and provide fuel systems that addressed all of the engine manufacturer and FAA fuel system requirements. These are belt driven propeller speed reduction units (PSRU) used to transmit power from a 350hp diesel engine and distribute it to three functions; a 3 bladed propeller; a 30kW 400hz AC Generator; and a high power closed circuit axial piston pump. On the airship there are three of the PSRU/diesel engine assemblies and their purpose is to provide loitering and cruise thrust, AC power and hydraulic power to the ballonet fans during all flight conditions. The PSRU assembly is made up of mostly machined aluminum parts for weight savings while incorporating hardened steel interfaces where shafts interface. To operate the propeller COTS parts from TPE331 propeller control system were modified to provide pitch control and these controls are coupled to Kawak electric linear actuators linked to the airships RS422 communication network allowing for fly by wire operation. To properly design, validate, and deliver the VTOL, LTS, and PSRU/diesel assemblies, Kawak designed and built a test rig that would support all of these unique engine assemblies. The test rig needed to be very versatile so there were many unique features built into the design such as an onboard hydraulic system used to operate wheeled outriggers for towing, a work platform, and an onboard crane . The engine assembly mounting pylon structure incorporated an engine vectoring gearbox and strain measurement systems to measure reaction forces from thrust. While performing tests personnel operated the engines from inside of the sound dampened, temperature controlled cab, using a digital interface panel and computers to monitor, operate, and datalog all engine assembly functions. Kawak as well as MAV6 personnel spent over 8 straight months performing various testing of the engine assemblies using this test rig. The pylon structures are tubular mounting structures that locate and provide a semi-rigid connection from the airship to the VTOL and LTS engine assemblies. They are made up of thin wall aluminum and steel tubing that has been bent, laser cut, and welded in order to create assemblies to conform to the shape of the airship hull. Their design is based on FEA analysis of the airships reaction to the forces exerted by the VTOL and LTS engines and has been optimized for a balance between durability and weight.